First bring milk to boil and simmer till it reduces to 1 and ½ cups. Turn off flame and bring to room temperature. Then add 1 and ½ to 2 tbsp of rose syrup to the milk and mix. Chill until use. Now make jelly by following the instructions on the packet. And cool and refrigerate. Once cool, cut into small cubes and set aside. Then make falooda sev by following the link provided above. Place in cold water and refrigerate until use. And now soak falooda seeds in water for 25 minutes and allow to bloom. Set aside. Then chill the serving glasses in the fridge for half an hour. Now to assemble falooda: Take the chilled serving glass and add a generous tbsp of rose syrup or rooh afza. Then add 2 tbsp of jelly cubes, followed by 2 heaped tbsp of bloomed falooda seeds. Next layer with ¼ cup of falooda sev or vermicelli noodles. Slowly pour the chilled rose milk till 3/4th of the glass. Next add two scoops of vanilla ice cream on top. 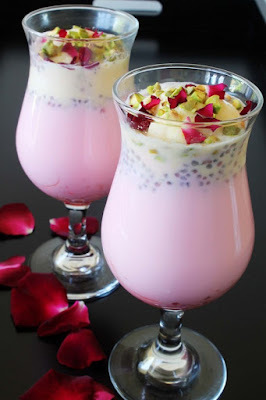 And finally serve this falooda any decorated glass.